I love day-after sessions because getting your portraits taken shouldn’t be rushed. I really value fostering a space where my creativity is nurtured by allowing things to happen organically without the constraints of time. By shooting the day after your wedding or elopement, pressure is alleviated and everyone is so much more chill. There’s more time to play, more time to explore, and more time to create meaningful photos. 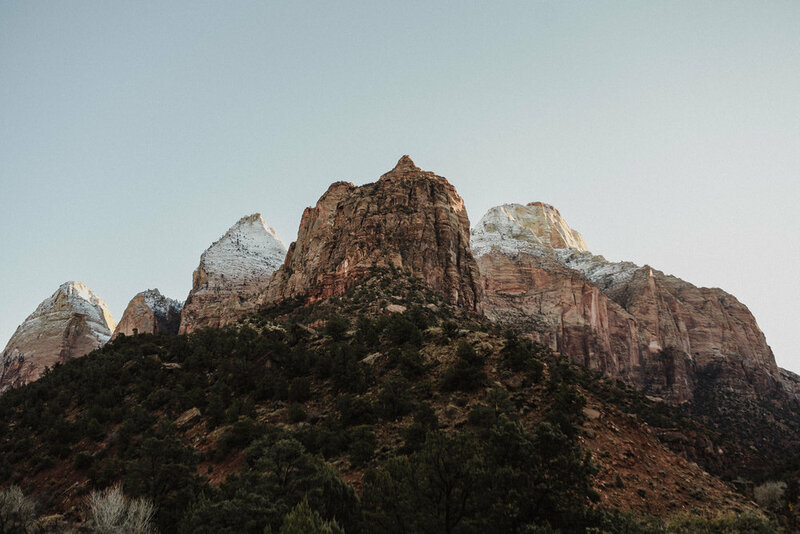 I flew with Karen & Vance to shoot their destination elopement in Zion National Park, Utah this past December. The morning after their wedding we woke up (super early too, at like 4:30 am!) in order to reach Zion canyon overlook before it got too bright out. Karen & Vance are two people who want to take advantage of all that life and this world has to offer. They are wanderlusters who bonded over their love for travel. They decided to get married in a way that uniquely reflected who they were - by eloping in a meaningful place surrounded by nature and loved ones. I spent half a week with them, flying with them from their home-base of Toronto to Zion National Park in Utah where they eloped this past December. We were 11 people in total - their closest friends joined us and their parents flew in from China. We stayed at Zion Villa - a spectacular meditation and retreat centre in a secluded area of Zion National Park. Throughout the day of their elopement, the weather changed non-stop. It felt as though there were four seasons all in the span of one day. After experiencing heavy rain, snow and hail, as they were about to say their I do’s - the sun burst out. Even with the harsh weather nothing could have dampened our spirits. We were alive and we celebrated love.